One field that has seen big improvements is the choice in orthodontic treatment options available to patients. Orthodontic appliances used to adjust the placement of teeth include traditional wire and bracket braces or Invisalign Clear Liners and here we take a look at the differences to see which is right for you. The standard in treatment for many years traditional braces are used to correct teeth affected by crowding, protrusion, alignment issues, irregular spacing and/or crookedness. A treatment plan is designed for each individual and will last a predetermined length of time to create a healthier more attractive smile. Dental braces are intended to correct more serious cases and the only treatment that will achieve the desired outcome. 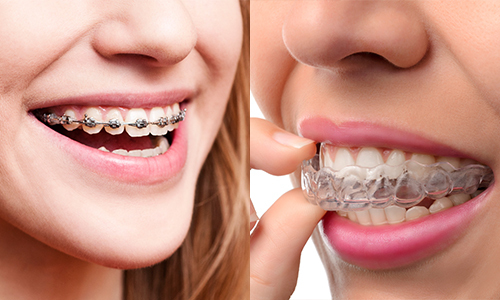 Often causing discomfort and embarrassment to wearers braces are a system of brackets and archwires placed across the teeth with elastics to secure them. The materials used for brackets can be metal, ceramic or composed of some hybrid combination of materials. It’s possible to have the brackets which are cemented to the teeth attached to the backs of teeth as well. Initial placement appointment takes about 10 to 20 minutes followed by scheduled appointments to replace elastics every 10 to 12 weeks. Length of treatment varies anywhere from 8 months to 2 years and a dental retainer must be worn for a period of time after braces are removed. Another alternative is available to traditional wire braces for some patients with the introduction of Invisalign Clear Aligners. They can correct overcrowded teeth, widely spaced teeth, overbites, crossbites, mild relapse ( after traditional braces treatment ) and simple bite irregularities. The biggest attraction of these plastic, custom made by computer appliances is that they are virtually undetectable while worn. Another big benefit is that they can be removed to eat, drink, brush and floss your teeth making them much easier to deal with than traditional wire braces and require wearing 20 hours each day. During the initial consultation impressions and photos are taken of the teeth then sent to the dental lab where a set is fabricated for just for you. As treatment progresses a new set of aligners is used to constantly move teeth to a new position with most adjustments for adults complete in a year. Invisalign clear aligners are a wonderful alternative and a more attractive idea however it should be noted that they aren’t designed to treat more serious orthodontic concerns. Why not give Viva Orthodontics a call now to learn about our invisalign in Surrey BC and we can sit down and discuss which option will achieve the best results for you.